The name of the company operating the basketball team: RAABERSPORT Kft. 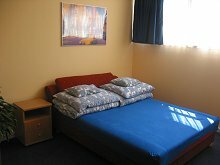 The team has been playing its matches in the Sports centre since the season of 1993/94, before it the matches were held in the University Hall. The Sportscentre was opened in 1987. At the beginning Soproni SE men' and Soproni Post�s women's basketball team played in this hall, but since the autumn of 1993 our team has been playing here. The junior team and amateur teams of the basketball and the handball team also train here. The sportshall is open from early morning to late night. The hall was designed by Ferenc Kangyal and his team in the course of which they planned multipurposed use of it and it was carried out. The grandstand can be folded in different positions depending on the purpose in the main hall which can be divided into three parts.There is a small hall in the Sportscentre ( for playing basketball), fitness, sauna, accomodation facility and a restaurant. Summer 2005 the hall was rebuilt. The MKB Arena Sopron was officially opened October 7, 2005, after having been renovated from inside and outside as well. With its new bleachers that can seat 2200 people, this multi-functional center is able to host not only fairs, exhibitions but also sport- and cultural programs of various size and high quality. Since 2015. April the name of the Arena: NOVOMATIC AR�NA SOPRON. The gym has now 3 basketball halls since summer of 2016. The goal of Raabersport Ltd. that operates the Arena is to provide the citizens and guests of Sopron with high level services and entertainment. The MKB Arena Sopron is situated right off Route 85, a couple of minutes from the city center and only a 5 minute drive from the Austrian border. Next to the Arena is a gas station, a shopping mall and a parking lot that can accommodate buses as well. By air: there are two airports near Sopron. The Ferihegy in Budapest is 220 kms and Schwechat is 70 kms from our town. Besides basketball games the Arena hosts local recreational sporting events, the indoor soccer tournament, and also various local, national and European sporting events. Due to its great properties, the Arena can also host cultural events such as concerts, theatrical performances, dance shows and other special events. The Novomatic Arena Sopron is a great facility to host exhibitions, fairs, conferences and smaller business meetings. The latest news can be read on the official website of the team ( www.wb-sopron.com). The Nemzeti Sport ( www.nemzetisport.hu), which is the sole sports newpaper of Hungary, the Kisalf�ld ( www.kisalfold.hu) are reporting the matches and the news of the team. You can find infos about us on a hungarian basketball portal www.wbasket.com too. Soproni Vasutas SE created the basics of Sopron's women's basketball that has a great tradition. We launched our youth development program in 1997 that works according to the pyramid-theory. More than 400 girls are doing this sport at our academy at the moment, from the pre-school age all the way up to the first team. Out of the many workshops that are dealing with only girls' youth development we were the first to get the certification from the Hungarian Basketball Association (MKOSZ) to become an academy (2012). For the trainings and matches of the competing groups we are using Novomatic Ar�na's gyms of which we have three at our service since 2016. One of these is the Academy Educational Center. We are collaborating with local schools and the first team of Sopron Basket, who are constantly participating in Euroleague. More than 100 children play and it help their development at our boarding camps and training camps organized at different points of our country. Soproni Vasutas Sportegylet (SVSE) club was founded in 1921, but during the early years the basketball was not well known in our country. However, it was rapidly gaining popularity in Europe, clubs were being formed in many countries, with SVSE joining the trend after the end of World War II, first establishing a men's and soon after a women's basketball section. Unfortunately, after a while it became obvious that only the women's club would survive, competing for many years in the Second Division of the national championship, eventually graduating to the First Division B Group in 1986. This came about after the club's management had decided to make available the necessary resources for the big step up in standards. By 1989 we had reached the highest level of the domestic championship, First Division A Group. 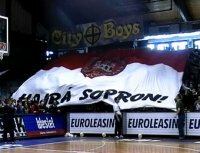 It marked the start of a long history of success for Sopron's basketball, which continues to this day. There was a couple of sixth places, which were the harbingers of later and greater achievements, the first of which occurred in 1991, when SVSE reached the Hungarian Cup final, only to fall at the last hurdle to a BEAC team which boasted among its members Bubu Balogh. At this point Andr�s Magyar was recruited as the head coach of the club in time, and he proceeded to shape a squad that wrote its name into Hungarian basketball history during the 1992-93 season. Bubu Balogh returned to her homeland from a professional stint in France to join SVSE and led the team to a convincing championship title. In the championship's playoff deciders SVSE overcame MTK 3-0, with Bubu scoring 45 points in the final match which the Sopron girls won 91-87 in front of a sellout crowd at the University Gym. Those who were lucky enough to be there, will never forget the celebrations at Sopron's Main Square later that night. The following season SVSE's ladies had to set about their task without the services of Bubu, who was preparing for the birth of her first child. 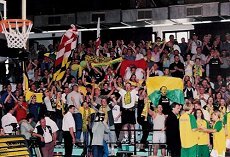 The team moved its home games to the larger capacity Sportcentrum and began to enjoy the security provided by the substantial financial support of a major commercial enterprise, GYSEV Rt. However, repeat success didn't come easily and in 1997 GYSEV's president, Dr J�nos Ber�nyi, decided the solution may lie in bringing back to Sopron its European class favourite Judith "Bubu" Balogh. Bubu's return also marked the arrival of her husband and outstanding coach, Saeed Armaghani. 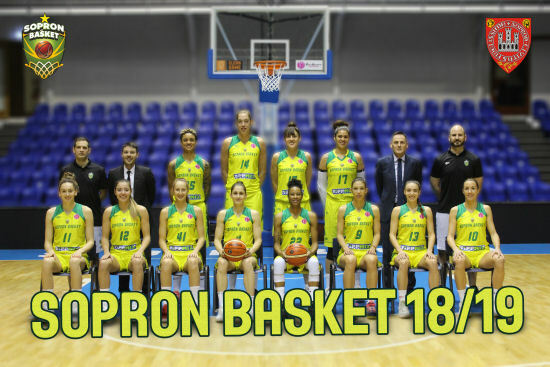 Efforts to substantially strengthen the playing staff were crowned with success, marked by the decision to move to Sopron by one of Hungary's best young talents T�mea B�res as well as the Lithuanian-Ukrainian Euro champion duo of Dalia Kurtinaitene and Sveta Orehova. This terrific trio had a major role in the team's Ronchetti Cup win, as well as silver medals in both the Hungarian Championship and Cup. The win in the Ronchetti Cup was the first by a Hungarian club in a decade and a half. However the ambitions of the club's leadership weren't quite fulfilled by this outstanding season - the aim was to win a national championship gold medal and the steady stream of new signings promised that all the effort would be crowned by success in the foreseeable future. In spite of a series of injuries, the team only suffered one defeat in the regular season, but could only manage a silver medal in the Hungarian Cup and also suffered elimination in the Ronchetti Cup. However, after several years' break, Sopron could once again welcome home - and deservedly so - the National Championship trophy after a 3-1 victory over eternal rivals P�cs. In 1999/2000 our star, Bubu Balogh, is taking an indefinite break to await the birth of her second child and the "foreign legionnaires" have all gone to new clubs. The replacements were, in the main, of a younger generation. A respectable debut performance in the Euroleague. We reached the best of 8 in the Euroleague. In the Hungarian Championship and in the Hungarian Cup only 2nd place. In 2000/2001 New faces in the team. Bubu came back and came to our team Alena Kovacova and Zuzana Zirkova from the Euroleague-Winner SCP Ruzomberok and Eva Seres from Ferencvaros too. 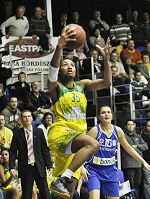 Again 2nd place in the Hungarian Championship against Pecsi VSK (3-2), and best of 8 in the Euroleague. The 2001/2002 season was again succesfull. We started the season year with 2 new point-guards. The australian Tully Bevilaqua and the young Szilvia T�r�k. And a new coach, S�ndor Farkas. The autumn was fantastic. We won and won and won. In dezember we lost the good rythm. So we couldn't reach the FINAL4 and we got silver at the Hungarian-Cup. But In June we won the Hungarian Championship against PVSK with an easy 3-0. Our next year wasn't the brightest. Besides, we managed to form such a players' group during the season of transfer which was qualified for the biggest aims. Eva Nemcova, Alessandra, Oxana Zakalyuzhnaya and Gordana Bogojevic also transferred to us. The bad luck started when Eva Nemcov� left our team which led to the point that we didn't reach our set aims at each place. But we didn't break down and we started to get better at the end of the season and to build our young team whose foundation is Natalia Hejkova coach, who spent the last months with our team together. 2003/2004. We built a new young team, the team of the future! We transferred two skilled players, Iveta Bielikova and Sanja Vesel. Beside them only young players played in the team, most of them were from our junior team who spent foreign year in our lent team to get skilled. We reached our aims! Our young team developed step by step. 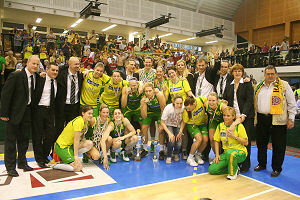 We had a lot of memorable victory at the Euroleague as in the Hungarian Championship. 2004/2005. We wanted to make another steps fore. We came back a young player - who spent last year in our lent team - Zsov�r Orsolya. But she injured in August. We signed a contract with the 20 years old center, Ivana Matovic, and Lucie Blahuskova! The czech player, Lucie Blahuskova is young too, but already wrote her name to the Book of the European Basketball. She was the MVP of the European-Championship in Greece (2003). We had a lot of problem in this year. We started the season really good. The high point was our win in Brno at the end of november. But something broke after it by the team. We lost important games in the Euroleague, so we had to play against Gdynia in the play-off. We lost both games. We had a lot of injuries after X-mas also. We lost key-players as Gordana Kovacevic and Vajda Anna for a long time and other players had injuries also for weeks. But we fought with 120%, and reached the hungarian final, what was our aim! We played some good games against PVSK in the final, but we couldnt stop them. So we got silver medals. 2005/06. We signed important contracts with very good players. Our 2 key-players, Lucie Blahuskova and Ivana Matovic signed for us 2 more years, until 2007! The biggest sensation happened in the middle of april, when we signed for the next year with Nikki Teasley! The WNBA Champion and All-Star MVP Nikki Teasley was the first player who broke Ticha Penicheiro's first position after six years with her 6.1 average assists in the WNBA! We signed a 1+2 year contract with Cserny R�ka, who will come back from the States, where she had very good years at the University of Harvard. We signed the hungarian national team-player E�rd�gh Edit, who comes back after 3 years to us. We signed with the young hungarian pointguard, Kocsis Bogl�rka, and with some our young talent also. We started the season with some uncalculated lost games. Thats why we started from bad position the Euroleague Play-off. But we made a big victory over Ekaterinburg, and reached the best of 8 in winning 2 games. For the FINAL4 we had to play against Valenciennes, but we had no chance, they played better and steped into the FINAL4. In the Hungarian-cup final we had a big chance to win at home against P�cs, but we lost in the last minute. In the Hungarian Championship Final P�cs won 3-0. 2006/07. After 3 years we changed coach and signed with Sz�kely Norbert for 2 years, who was our assistant coach. Nikki Teasley left our team, and so were searching for a new point guard too, and signed with the hungarian national team player N�meth Bernadett from Zalaegerszeg. This year was the most successful in our history. In the Euroleague we stepped into the best of 8 again, where we couldn't stop the russian 'mega-team', CSKA Samara. In April, first time in our club-history we won the Hungarian Cup against Szeged! In the Final we played against P�cs, and on the 15th of May we won the championship, after 5 dramatic games, 3-2! We will never forget this enchanting season. 2007/08. We replayed the gold season! In Summer we signed with young talented players: Jelena Milovanovic, Horti D�ra, Semsei Barbara and Iva Sliskovic. In the first half of the season we couldnt play levelly, but after the Christmas we started to be stronger step by step. We reached the play-off in the Euroleague, but there we had no chance against Bourges. In the Hungarian cup we show our best performance in the year! In the Final, in P�cs we won 77-63 against the home team. In the championship we walked easy into the final, where we started the games in P�cs. We won the first game and also the second! We lost the third in P�cs, but on the fourth game in Sopron we have shown our best face and won the game and with this victory the championship too! 2008/2009. Historical Season! Well we signed again with young players: Krivacevic Tijana (hungarian national team player), Kathleen Macleod (Australia) and Amber Holt (USA). At the end of November we lost Kathleen Macleod, our pointguard for a month because she had appendicitis surgery, but we could win without her in P�cs, in Brno and against CSKA Moscow! With these victories we built a strong ground for another nice results. In the Euroleague we had to fight against one of the icons of the European women basketball, Bourges Basket. We were on top form, and we could win in Bourges, and after also at home. So we reached the FINAL4 with the youngest team of the Euroleague! It was the biggest result in our history! In the Hungarian Cup we lost in the final at home against P�cs, but we were preparing at this time for the FINAL4. In Salamanca we finished on the 4th place, what was an unbelievable achievement! We celebrated in Spain together with our fans and sponsors. After the F4 had to wait us an other challange in the hungarian championship. The opponent team in the final was Szeged. We won by 3-1, so we stayed on the top of the national league! This was our 3rd championship title in row! What a great season! 2009/2010. After the historical season we tried to keep the team together. It was almost successful, only Kathleen Macleod left us. We signed with two young players: Maja Miljkovic (Serbia), Varga Zs�fia (hungarian national team player). The pre-season started perfect: we got an invitation to the International Tournament to Ekaterinburg, where we had strong games against USA, Ekaterinburg and Prague. It was a big honor! But this was the last golden moment in our season... We started the Euroleague with two important victory, but after we had a lot of injuries. We missed a lot of players from our roster, and we lost many games not only in the Euroleague but also in the Hungarian Championship. In the last round we played against Prague at home, but we couldnt live with our last chance to reach the play-off(93-96). For the rest two months of the season we signed with an american point guard, Kristi Toliver. With her we won the basic season in the Hungarian Championship with a great finish. One week later we lost the Hungarian Cup in P�cs against Mizo with a last second shot of Anna Vajda (70-72). That was a sore defeat, but the Hungarian Championship final ended worse. In the play-off something broke in our team effort, and we lost 3-0 against P�cs, and two games at home court... That was the end of a difficult, wash-out season. 2010/2011. We refreshed our roster with good players, included with a "Big name", Angel McCoughtry, who was one of the best players in the WNBA. Only Diana Taurasi scored more points than Angel. The other newcomers were: Zane Tamane, K�tya Abramzon, Bogl�rka Kocsis, Di�na F�r�sz, T�mea Czank and Fanni Szab�. The season started bad, because Bogl�rka Kocsis had to finish her career bacause of health problems. In the first round of the Euroleague we lost for the rest of the season T�mea Czank too, because of a serious knee injury. But in this situation we started the season with good results in the Euroleague and also in the Hungarian Championship. But at the end of the year one of our main sponsors, MKB Bank stepped back from sponsorship. Our management decided to sell our key-player, Angel to the turkish team, Fenerbahce. We also let to go K�tya, back to Israel. After this transactions we had chance to sign with few accomplished players who earlier played for us: Edit E�rd�gh, D�ra Horti, Bernadett N�meth. Marissa Coleman from the States also signed for us for the rest of the season. So in the middle of the season we had to build a "new team". So it wasnt a surprise, that we had a difficult January, but we started to be better and better. We reached the play-off in the Euroleague, where (best of 16) our opponent was the famous star club, Ros Casares Valencia. We made a miracle in Sopron, when we beat the spanish team. But in Spain we had no chance, so they reached the best of 8. For us remained the "hungarian line". The Hungarian Cup final was in K�rmend, where we played the Final against P�cs. They killed us one week before in the last round of the basic season, but in K�rmend we were the better team! Marissa injured in the first quarter, but this didnt break us and we have shown a really great performance, and won the Hungarian Cup! With this nice result we waited the championship play-off. In the final we lost the first 2 games against P�cs, and the third battle was in P�cs. Everybody waited the success of P�cs, but we came back to the final!. We won in P�cs and the 4th game in Sopron too. So the 5th game decided about the chamiponship. And what a game! In one of the most excited final game we could win after overtime in P�cs! That was our 7th championship gold medal in our history! We finished with this great success an unforgettable season! 2011/2012. After a beautiful season we knew, the next will be much harder. Our one of the most important players, Kata Honti decided to go to Valencia. We had to leave Zane, Amber and Marissa too. We tried to build a more "hungarian" team, so we signed only one foreign player, Olexandra Kurasova who came back to Sopron after a maternity leave. We signed also a contract with Zs�fia Fegyverneky, who came from the rival P�cs. The other new players were the hungarian-australian Zavecz Hanna and Krnjic Sara. In the Euroleague we were strong at home, but abroad we won only one game, in Tarbes. So we had no chance to reach the play-off. It seemed, in Hungary we are stronger than our rivals. We didnt loose any games during the regular season! We signed also with Berndett N�meth, who came back from Good Angels Kosice. Gy�r organized the Hungarian Cup Final4, where we won our 4th Cup gold medal in our history. In the final we beat the host team, Gy�r. We wanted to sweep the champ title too. Until the first game of the final it seemed, it will be easy. We killed Gy�r at the first game in Sopron by 19, but after we lost 2 games. It was really a shock for us! On the 4th we stood up from the floor, but the 5th game was again a nightmare for us. We lead 55-49 at the 35th minutes, but in the last 5 minutes we couldnt score and lost the final against a high motivated Gy�r. One gold and one silver medal, the result of the season. It wasnt a tragedy, but alltogether the end was disappointed. 2012/2013. We stayed on the way we started many-many years ago. We refreshed our squad and let to go a lot of players. We built a full-motivated team, with a strong starting five and a young motivated bench, so we signed players who are ready for this: Jelena Milovanovic, Shenise Johnson, Anita Teilane, Orsolya Zsov�r, Szandra P�l. In Dezember we had to make few changes. Hanna Zavecz had to go back to Australia because a serious injury. We signed for her position Amber Holt, who played for us earlier. Anita Teilane left also the club, but we reactivated the former national team player R�ka Cserny, who finished her career earlier, but now decided to help us again. We had a historical season! In the Euroleague we played many good games, also against one of the strongest clubs in Europe, but lost most of them in the last few minutes. That was really frustrated. On our last game we won in Rumania against Targoviste, but in the last round, when we were free, Kosice couldnt win against Targoviste, so we didnt reach the play-off. 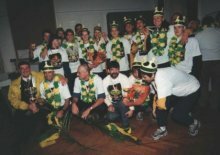 We organized the Hungarian Cup Final4, and on this weekend we celebrated our first championship title, which we won 20 years ago. We played very well and we won in the final against Gy�r with 27 points. This Hungarian Cup title was our third in row! In the Hungarian Championship we had no rivals! We made a historical season! We won our 8th Champ title, and without any lost games! Two weeks later we travelled to Kosice to the Slovakian-Hungarian Championship Final4. In the semi-final, without Amber Holt, we won against Ruzomberok, but in the final we couldnt stop the organizer. But this silver medal was for us a very nice end of the season! 2013/2014We made few changes in our roster, and signed also with a new coach, with Mr. Igor Polenek from Serbia. Our new players were: Kelly Farris, Tianna Hawkins, Katarina Tetmondova, Dragana Stankovic and Zs�fia Simon. Our season was like a "wave", and finished disappointed. We reached our main aim, to go the Eurolegaue play-off, and we played final in the Middle European League. But on the other side we lost the Hungarian Cup Final against PEAC-P�cs, and we lost against them also in the semi-final of the Hungarian Championship by 2-1 (two games with only 1 point...). After we stood up from the floor and won against DVTK by 2-0, but this bronze medal didnt shine for us and our supporters. We had a difficult season, with a lot of problem, and this came out at the end of the season too. 2014/15 We have left the Euroleague after 16 years, and started in Eurocup Women. We signed contract with three young players from abroad, the serbian talent, Aleksandra Crvendakic, and two american talents, Bria Hartley and Kayla McBride. The hungarian national team-player, N�ra Nagy-Bujdos� signed contract with the club as well, but she could spend only a month with us as she got pregnant. We started the season very well in the Hungarian Championship and in the Eurocup too. We haven't lost any games until the end of January, when we started to prepare for the Eurocup Play-off, and so lost a game at home against PEAC-P�cs. Before this game we signed a contract until the end of the season with the hungarian national team player, Tijana Krivacevic, who arrived from Kosice. With her our dream was to get to Eurocup semifinal, but in the best of eight, Maccabi came as a train and simply killed us. We had no chance to go further. After this nightmare we had a game in Gy�r, where we could win and we finished on the first place in the Regular Season of the Hungarian Championship. At this point we have changed the headcoach. L�szl� Sterbenz gave a new fire to the team and won easily the Hungarian Cup against DVTK Miskolc. Was a great evening! In the play-off we had no difficulties until the final, where the opponent was again the team of Miskolc. This final was exciting, high level, simple brilliant! We had a 2-1 loan when we played in Miskolc and could win before 2500 fans of Miskolc by 2 points, and so the Championship! We finished a difficult, exciting and beautiful season with 2 gold medals! 2015/16 With that success we arrived to the current season, when we return to Euroleague with a very young team. Fegyverneky gave birth to a boy in spring and she returned. From Miskolc came to us the australian shining star, Abby Bishop. We signed contract with young players as Bernadett Hat�r and Debora Dubei for 3 years, and our young talent, Vir�g Weninger got also a 3 years professional contract. In the roster we can find another 2 young players, Laura Aldazabal and Dominika B�r�ndy. We hope, we can make our supporters and fans happy with our very young team this year! Our town which is lying next to the Austrian border is one of the most visited cities of Hungary with its beautiful sights and varied natural beauty. The clear air and the picturesque land of Sopron attract thousands of tourists. The beauty spot counting about 60 thousand inhabitants is situated at the foot of the Alps and between Balfi hills which is next to the Fert� lake.The highest peak of the Soproni mountains which is surrounding the town is Magasb�rc with 557 meter. The downtown itself was built along the bank of Ikva. The surrounding area is rich in sources, the most well known ones can be in Balf. The Fert� lake, the third biggest lake of Centre -Europe is lying north-east of Sopron. The climate of Sopron is missing any kind of extremity. The summer is not too hot and the winter does not last long time. Its history goes back to long centuries. The first man appeared in this area at the prehistoric age. The Celts settled in this country in the 4th century BC, who were followed by the Romans some centuries later. They built the so-called Amber Road and its marks can still be found downtown today. Scarbantia,the way how the Romans called our town, became trade and administrative centre soon. At the beginning of the fifth century the town was attacked by some enemies after that fire and earthquake destroyed the town. The rebuild started in the ninth century. More and more German craftsman, winegrower and Jewish salesmen settled in the town and its neighbourhood. Sopron got the city rank from King L�szl� the fourth in 1277. Our town was called �denburg by the German inhabitants.At this time St. Michael church was built. In the fifteenth centrury new constructions were started. One of its reaults is the St. George Church. In 1524 the Reformation spread in the town, and after five years the Osmanli Turks appeared in the town. The town was developing in the field of culture and economy in the first place when the mayor was Lackner Krist�f. In 1676 the town was ravaged by fire but it was rebuilt by the eighteenth century. At this time the V�rker�let was built and the imge of the downtown was constructed. 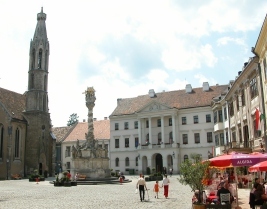 The citizens of Sopron started forming in the nineteenth century. Some famous people visited Sopron. The nine-year-old Liszt Ferenc gave his first concert. In this town Pet�fi S�ndor, the poet was a soldier. In 1835 Sz�chenyi Istv�n, who did a lot of things for the town: he built a steam mill, founded saving bank, supported the building of the railway, was elected as honorary citizen. The brewery was built in 1894 which was followed by iron-foundry, distillery and textile industry. At this time the theatre still had worked. The peace-treaty following the First World War set the town a big decision. The citizens showed their loyality to the country at the referendum. The Fidelity Gate and the 'Civitas Fidelissima' ( the most fidelity town) name remind us of it. The developing was interrupted by the next World War causing big damages. Sopron haas been managed to be cultural and tourism centre by hard and careful work. The protection of monuments plays a very important role. As its result Sopron won the gold medal of European- prize of Protection of Monuments founded by F.V.S Foundation in Hamburg in 1975. The development keeps on today. Our town is famous for its wines ( traminin, k�kfrankos, z�ldveltelini), its downtown, buildings, the Firetower, cultural events beautiful holiday resorts, the L�v�rek, college life and sportslife. The latter proves that our town won the title of "Town of Basketball" first.